Never Split Tens is a major motion picture based on the life of the mathematician who developed the card counting technique for the casino game of blackjack. Its production budget will be raised by loans taking advantage of Illinois income tax credits and federal income tax deductions. The cover of the book "Never Split Tens," a biographical novel by Les Golden of Oak Park, Illinois, based on the incredible true story of blackjack scholar Edward O. Thorp. The book contains a comparison of blackjack systems, an acting primer into camouflaging being a card counter, and an extensive biography of Hi-Lo developer Harvey Dubner. 4 Why Isn’t Everyone Doing This? Logline: When an eccentric M.I.T. math professor develops a computer system for winning blackjack and tests it with mob-backed money in casinos, he loses his wife and job but redeems himself when his huge winnings cause a revolution in the casino industry. Based on a true story. Motion pictures can be characterized as plot driven ("Body Heat" and "The Sting"), by their setting ("Star Wars" and "Harry Potter"), or character driven ("A Beautiful Mind" and "Catch Me If You Can"). This motion picture is character driven. As a result, Never Split Tens will be casting A-list actors in the roles of the protagonist, his wife, and the gangster. This will attract distributors in all modes, box office, electronic, and ancillary (please see Section Investor Share of Profits below). The funding mode is a concept that professional accountants could suggest to clients to whom they provide tax savings advice. This concerns earning substantial Illinois motion picture production income tax credits (35 ILCS 16/) and federal motion picture production income tax deductions (U.S.C. 181). THIS IS NOT A TAX SHELTER. IT IS A LOAN/INVESTMENT WITH A RETURN BASED ON STATE AND FEDERAL STATUTES OF UP TO 58% (based on federal income tax bracket). The earnings ARE NOT dependent on the motion picture generating any profits; they are based SOLELY on the production budget being spent in Illinois. Much of the producers’ understanding of this "loan-investment" scenario came from an accounting firm which is on the list of the Illinois Film Office as those who purchase tax credits from film production companies. In the usual case, the film company obtains the tax credit after completion of filming. Our concept is to reverse the scenario: The producers of Never Split Tens will be obtaining a tax credit and are seeking an entity or individuals to provide a loan based on that tax credit as collateral before production begins. Accountants are encouraged to suggest this concept to their select clients seeking substantial no-risk tax savings. As we will show, up to a 58% return on the investment can be obtained depending on the federal tax bracket. The obvious question is why aren’t all wealthy individuals and corporations utilizing this? First, the Film Production Services Tax Credit Act of 2008 became law only recently. Many wealthy individuals and firms are simply not aware of it. Many accounting firms are not aware of it. Other than that, the primary answer lies in the Illinois income tax rate. As will be seen in the examples provided later, a funding entity or individual must have a large Illinois tax liability to be able to take advantage of the Illinois Film Production Services Tax Credit Act of 2008. The previous 3% tax rate did not create a sufficiently large tax liability. The 67% increase to a 5% tax rate now makes many more entities and individuals able to take advantage of that state law. Corporations and partners in accounting firms are now beginning to see the advantage of the concept we are proposing. The mode of funding proposed has been underutilized for other reasons. First, it suffers from the belief that investment in motion pictures is extremely risky. While this is true, the mode proposed here DOES NOT depend on Never Split Tens earning a profit. Second, large budget blockbuster movies require large up-front investments and low-budget motion pictures cannot benefit from the current proposal. Only intermediate-budget motion pictures such as Never Split Tens can be funded in the manner proposed. Finally, relatively few motion pictures are shot entirely in Illinois. Many motion pictures are shot in multiple states. Some locations may be shot in Chicago, for example, but the sound stages are based in Los Angeles. 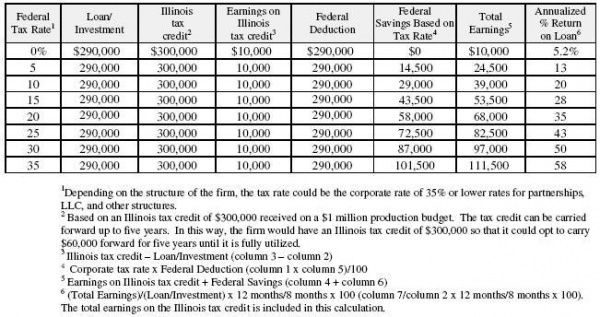 The cost of production, as a result, is split among those states rather than occurring entirely in Illinois, reducing the value of the Illinois tax credit. In short, the mode of funding is only viable for moderate-budget films shot entirely in Illinois since 2011. Never Split Tens fulfills those requirements. The producers request loans totaling $290,000 for up to eight months from those with large state and federal tax liabilities to whom you provide professional accounting and investment advice, or from private individuals or firms. The loan is based on Illinois and federal statute and is free of risk. b) federal tax deductions based on U.S.C. 181. The loan will provide a significant portion of the production costs of the filming of a major motion picture in Illinois in the popular casino gambling genre. The eight month period results from a projected five month filming period and a two to three month period for receipt of the Illinois tax credit from the Illinois Film Office after filming has been completed. Please note that the request of $290,000, while based on a preliminary production budget estimate, is for illustrative purposes. The actual amount requested will result from an audit by the Illinois Film Office of the production budget. This will determine the actual amount to be spent in Illinois. The producers calculate below an annualized 35% return using a federal tax bracket of 20% and an annualized return of 58% using a federal tax bracket of 35%. These surprisingly large returns result entirely from state and federal government investment incentive programs. Unlike many other vehicles, the tax benefits of film production are independent of whether or not the film makes a profit. They result solely on expenditures during production being made in the state of Illinois and the United States. By 35 ILCS 16/ -- Film Production Services Tax Credit Act of 2008, films shot in Illinois are provided a 30% tax credit of the production costs spent on Illinois residents, firms, and vendors. The tax credits are transferable and can be carried over five years. About forty states have similar tax incentive programs, to reverse the flight of film production to Canada and now increasingly to Mexico. An additional credit is provided equal to 15% of the salaries of at least $1000 of residents living in economically disadvantaged areas. For the purposes of this proposal, we will not include this additional tax credit in our calculations. Film Production Services Tax Credit Act of 2008. Section 5. Purpose. The General Assembly finds that the Illinois economy is highly vulnerable to other states and nations that have major financial incentive programs targeted to the motion picture industry. As an example, say a film company spends $1 million in Illinois in 2013. They obtain a 30% or $300,000 tax credit. That credit can be transferred to any entity which has an Illinois tax liability and, assuming the film production occurred in 2013, it can be broken up into credits from tax year 2013 through 2017. This is not a deduction; it is an actual tax credit. In the usual scenario, film companies obtain payment of the tax credit from the state of Illinois after production is completed, sell those credits through a broker, and use the proceeds to cover post-production expenses such as editing, sound dubbing, and deferred A-list actor salaries (usually combined with points on the film profits). The credit is provided by the state to the producer after auditing, within 2-3 months of the termination of film shooting. As a result, if the film takes 4-5 months to shoot, the credit is provided by Illinois within 6-8 months of the beginning of shooting. 2. the large middle-man broker fees. The producers of Never Split Tens are reversing the scenario. They will be obtaining a tax credit and are looking for an entity or individuals to provide a loan based on that tax credit as collateral before production begins. The producers therefore wish to approach those with large Illinois tax liabilities. Either corporations doing business in Illinois or attorneys in large firms are appropriate fits. Some of these have large incomes, large tax liabilities, and are associated with a significantly large number of partners. The appropriate manner by which to approach these groups is through their advising accountants. Film production costs, by U.S.C. 181, are deductible: Investments in a motion picture filmed in the United States are 100% tax deductible for the investor in the year of investment. The motivation, again, is to reverse the flight of film production to Canada and now increasingly to Mexico. The Illinois film office, our accountant, and our entertainment lawyer agree that the amount of money loaned can be considered an investment under U.S.C. 181. In this example, ten individuals provide the loan based on their relative gross incomes. The results for their considerations based on both the Illinois tax credit and the federal deduction are provided in the table. The individuals are assumed to be in the 35% federal tax bracket. The annualized return resulting from the total of the Illinois tax credit and the federal deduction is 58%. The Illinois income tax credit and federal income tax deduction basis for funding of Never Split Tens. If a single firm provides the entire loan, its loan-investment of $290,000 results in a $290,000 million federal deduction. For those in, for example, the 20% tax bracket, this results in a tax savings of $58,000. The earnings on the loan ($58,000+$10,000)/$290,000 x 100 = 23% for eight months, equivalent to 35% interest annualized. A corporation paying federal taxes at the 35% rate would earn 58% annualized. As mentioned earlier, please note that the request of $290,000, while based on a preliminary production budget estimate, is only for illustrative purposes. 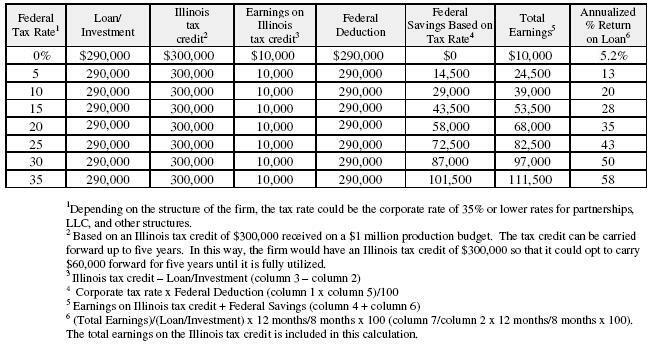 The Illinois income tax credit and federal income tax deduction basis for funding of Never Split Tens for corporations in a given federal tax bracket. In addition, as investors, the loaning entity or individuals would receive a percentage of the profits earned by the film. The film will be distributed in all modes, for domestic and international box office, in electronic media, and in ancillary distribution (such as in prisons, cruise ships, summer camps, colleges and universities, and on airline flights). The majority of motion pictures do not earn a profit solely from domestic distribution. The percentages of the box office taken by the domestic exhibitors (theatre owners), distributors, and agents are significant. Most profitable films earn their profits from international box office, electronic media, and ancillary distribution. These revenue streams are realized within a year of theatrical release to ten to fifteen years after theatrical release. Statistics of movie profitability demonstrate that character-driven films, because of their casting A-list stars, are attractive to exhibitors and distributors because they have the best chances of attaining profitability in the long run. The success of this project and the viability of its presentation to clients by an accountant firm requires that the producers guarantee that the funds loaned to the production company are appropriately spent. Therefore, numerous steps will be taken to ensure compliance with 35 ILCS 16/. f. That accounting is provided to the accountant firm or loaning entities daily. 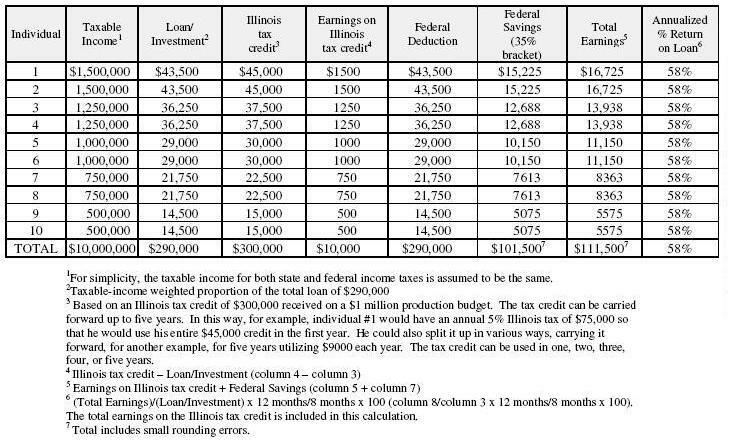 The loan/investment proposal takes advantage of Illinois and federal statutes and now promises a large return because of the increase in the state of Illinois income tax rate to 5%. For an up to eight month loan of $290,000, the loaning entity or individuals receive $300,000 (Illinois income tax credit) + $290,000 (Federal income tax deduction) = $590,000 in consideration. Based on a 20% corporate federal tax bracket, the net "earnings" are $10,000 + $58,000 = $68,000. That yields an annualized 35% return on the $290,000 loan/investment. Based on a 35% individual federal tax bracket, the return is equivalent to an annualized 58% return. Please note that neither the state nor federal tax credit/deduction is based on the motion picture earning any profits. They result solely on expenditures during production being made in the state of Illinois and the United States. In addition, as investors, the loaning entity or individuals would receive a proportion of the profits earned by the film. The film will be distributed in all modes, for domestic and international box office, in electronic media, and in ancillary distribution. Strict compliance with the terms of 35 ILCS 16/ is assured by daily accounting during the filming of the motion picture. The producers’ entertainment lawyer has drafted a complete prospectus if you wish to receive a copy. This highlights the risks of investment in film production, but as noted the state and federal tax benefits of the loan are independent of whether or not the film makes a profit. The prospectus would provide information on the potential profitability of the motion picture. The producer, with their attorney, would be happy to discuss this proposal further with accountant firms and their counsel or loaning entities and their counsel at their convenience. A representative of the Illinois Film Office would be happy to attend. This page was last modified on 29 October 2017, at 13:14.